Last chair to view for now….this one was given to my upholstery guy by someone who was “throwing it out”. He reupholstered it for a talk we did together with Carol Sarason (window treatments,pillows,bedding) on decorating at Carlton-Willlard in Bedford MA for senior citizens. I loved it so much that I kept it and brought it down to my summer house. 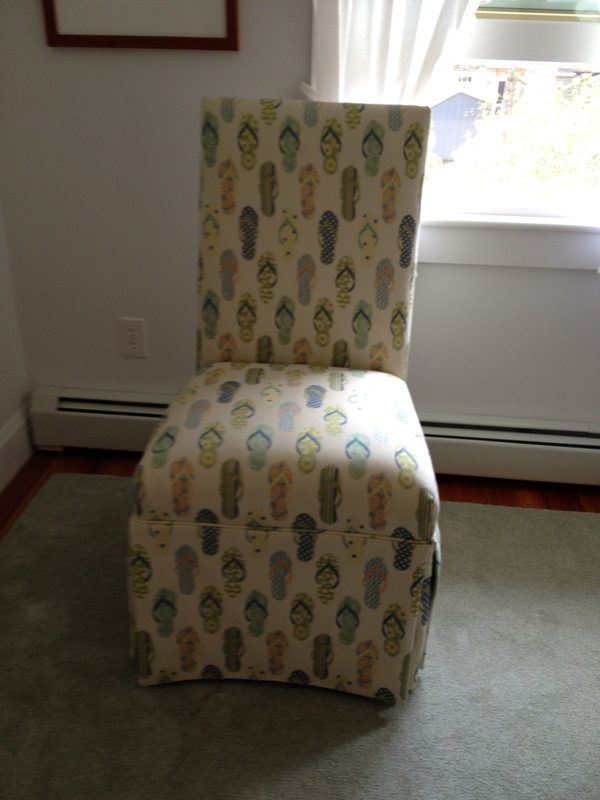 Sometimes all it takes is finding a fun fabric-keeping in mind the scale of the pattern and the style of the chair. This entry was posted in reupholstery, summer/beach houses and tagged Duralee Concord Falmouth decorating. Bookmark the permalink. ← “Well, I do have”…..
i am so ready for you to save my chairs! Let’s talk. Concerning beach house upholstery, are you can you recommend good fabrics that resist mildew and “kid-dew”? yes-all of the companies have their version of “sunbrellas”-they are all best for mildew and kids and sun at beach houses. Finding the right fabric for a room….would love to come take a look!